1 Rinse the lemon in hot water, dry and zest. In a bowl combine zest with flour, bran, baking powder, sugar and a pinch of salt. Mix well. 2 In another bowl, whisk together milk, egg and oil until smooth. Add to flour mixture and mix until smooth. 3 Peel banana and mash well with a fork. Add to batter and stir thoroughly. 4 Sort through blueberries, removing any stems; fold gently into batter. 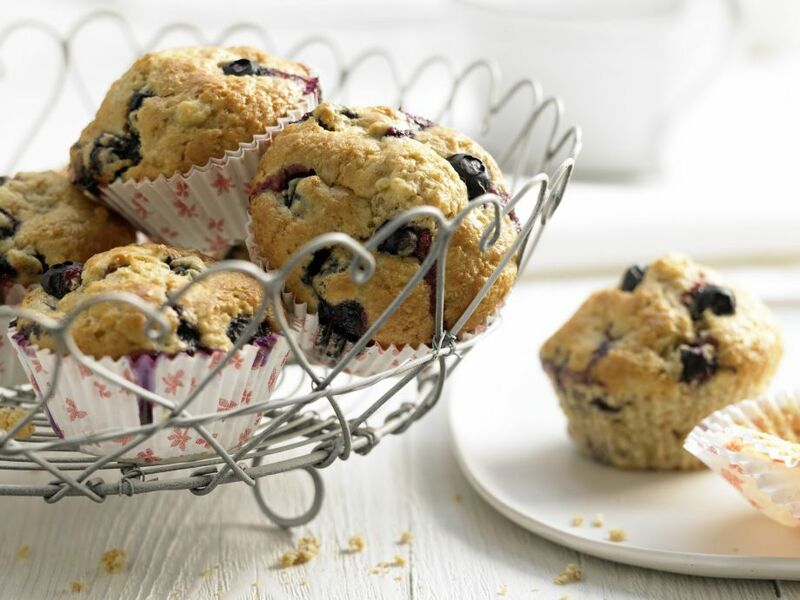 5 Line a 12-cup muffin tin with paper baking cups. Divide the batter evenly among the cups. 6 In a preheated oven at 200 ° C (fan 180 ° C, gas mark 3) (approximately 400 °F), bake muffins until a wooden skewer inserted into the center of a muffin comes out clean, about 30 minutes. If it comes out clean, remove muffins from oven. If not, bake for a few more minutes. 7 Remove muffins from pan. Allow to cool on a wire rack for 5 minutes; serve warm or room temperature.